Kant wishes to unground dogmatic and skeptic alike. He asks what if anything could provide for the universality and necessity of first-order metaphysical claims about reality with the same inarguableness as mathematical proofs. But, after all, how could we call knowledge that which produces endless dissensus? In the celebrated antimonies we have a dramatic face-to-face encounter on each of the major problematic points (god/soul/genesis/freedom), compelling the skeptic and dogmatic to come before the tribunal of reason and present their cases side-by-side. With a genuinely novel critical model of reason itself, Kant will explain why these problematic points arise, attempting to isolate their transcendental structure, grounding these problematics as inevitable consequences of the combination of the (spatiotemporal) structure of experience with the various categoreal logics (e.g., modality). These problematic points are like natural illusions, or mirages on the plane of reason, to which any reasoner may fall victim, when naively combining the pure elemental components of experience in certain ways. Both the direct assertion of an inarguable knowledge of some purely metaphysical feature of the structure of reality and the denial that there is any such knowledge of reality at all, positive or negative… these will each be rejected as the dogmatic and skeptical errors, in favor of a critical reasoning-out of the conditions of experience (almost incidentally exposing the insufficiency of the first-order accounts.) The critical account consists then of an analysis of the conditions of possible experience, identifying transcendental elements whose universality and necessity equal that possessed by the constructions and derivations of the geometers and physicists. The critical philosophy then provides a deduction of the problematic points which predicts or accounts for their dichotomous structure (almost incidentally explicating the undeniable sociological fact of dissensus or bifurcation). For Kant, to get to metaphysical knowledge that might be considered as universal and necessary, reason has to become critical, aware of the misunderstandings it is capable of, the limitations of its formal systems, the necessity for experiments. Painstaking effort is required to ascend towards conditions, navigation on more-than-speculative high seas, not guaranteed success even if regulated by rational critique. Kant’s first analytic machine, the transcendental aesthetic, operates a maximized abstraction, a total event- or object-reduction which leaves behind nothing but pure forms. These forms of space or time are ineradicable from phenomena, and even in thought inseparable from the notion of possible experience. This process is almost an empirical reductio: a successive removal of properties from objects and events in the imagination, deconstituting empirical content to extract phenomenological forms or categoreal universals, these transcendental conditions of any possible experience whatsoever. The conditions of experience implicate the (discoverable) consistency of a world and the (potential) decidability of ontological relations within it. This conditional line is the narrow opening through which criticism bypasses first-order metaphysical claims. The critical philosophy derives a new speculative line of escape to follow, neutralizing the endless (dogmatic-skeptic) conflict. Instead of interminable speculation on that which is indeterminate, we can extract transcendental features or traits to explain the foreclosure, deduce the irresolvable point and identify the shape of the dialectical illusions which converge around it. The tower functions as a vehicle for rational systems, and stands in for their architecture or “architectonic”, the way in which systems and syllogisms synthetically link up or hang-together. How can we form extended principled arguments in pure metaphysics, that is: construct arguments that have the same universality and necessity as the Pythagorean theorem, or the Newtonian laws of motion? (In this question is the life and death of metaphysics, according to Kant…) The critical philosophy investigates the answer to this problem: how metaphysicians could ever be able to conduct the same sort of sure and steady syntheses as geometers and physicists, who possess the advantage of bringing along with each of their propositions a chain of deductions, following a formal mechanism for reproducing their truth reliably. Kant concludes that because we have no direct access to things-in-themselves (both transcendence and immanence barred as dogmatic and skeptical errors) we must instead analyze the conditions of experience. By systematically dismantling possible experiences, we find the pure forms of space and time in the well-known transcendental aesthetic. In combination with the transcendental logic of the categories, thought assembles the notions of the understanding which will in turn be grounds for rational cognition of the ideas. The transcendental ideas of reason are regulative but not, as Kant says, constitutive: they themselves cannot be used to stitch together pure syntheses, because they are dialectical. Nevertheless the ideas of pure reason function like singular points of the problematic field of reason; they are the synthetic objects of the antimonies: god, the soul, genesis and freedom. They may all be derived in turn from spacetime and the categories placed into conjunction or combination. For instance: the problematic of genesis may be understood as a consequence of one of the categories, in this case quantity, being conjoined to an aspect of spacetime, or temporality, as formulated concretely in the curious question, “how far back does time extend?” whose opposing solutions (a finite duration, eternity) the antinomy elaborates. The ideas of pure reason are dialectical so reasonable arguments can be made on both sides of the problematic points, hence the truth of these points is not decidable by pure reason alone. In a movement of stepping back from first-order metaphysics, Kant famously wishes to “leave room for faith”. The critical philosophy is as much not-skeptical as it is not-dogmatic; it is instead transcendental, enchanted with the purity of abstraction even as it regulates and judges existence. The courthouse, the tribunal, the critical apparatus of a philosophical trial: all this appears to be a disappointing answer to the initial problem in a way. There are certain points that we cannot answer definitively, although it is also not enough to say that they are ineffable. We must try to explicate the inconsistency. For these are problems created by reason, so reason must answer for having produced them. This is a refrain of the critique, that reason must begin to answer for its long errors and dispute, and to explain in detail why it is impossible that thinking should be able to approach the problematic points without illusion or error. What is the new relationship, constructed during the Enlightenment, between individual freedom and scientific experimentation? What moves us towards this luminous height, towards the open development of new collective capacities? What grounds this good faith use of formal reason in life, culture, politics? A critical Enlightenment moves inexorably against the moment — entering into combat with bad faith and long errors. How to navigate in thinking? The critique traces the dynamics of the topological relations within the virtual space of rational construction on the plane. The speculative high seas of pure reason are made navigable only when reasons becomes critical, crucial, capable of not just assertion and denial but finally of determining a definite experiment (to facilitate performing a deduction or Decision…) In criticality, thinking, (but also acting, feeling) become the material evidences of a trial. As it undergoes this critical trial, the plane of reason unfolds or becomes involutive. Transcendental lines contract thinking into a synthetic black hole, into a singularity capable of being deduced. Critical reason maps out the problematic points which will distort the entire field. Kant has a moment in the Critique where he calls out the bad faith of those who want to abandon responsibility for the singular problematic points (of god, the soul, freedom, genesis) — saying that they are ineffable, etc. Instead Kant explains that precisely these are the questions which reason must answer for, since it has created them. Moreover once we detach from the illusions haunting these points, we can take another approach: transcendentally deducing these problems as singular combinations of transcendental abstracta, as fusional momenta of the categories and spacetimes. We want to follow this movement which attaches spacetimes to categorealities. We want to catch sight of the emergence of ratiocination. Our freedom depends on strategic use of reason. How can our thought become worthy of freedom? This is in a way the central problem of Enlightenment, part of the motivation for its ethos of autonomous experimentation. Kant dreams of reducing or minimizing the law, extracting transcendental principles from which more complex decision-structures can be elaborated, so that specific cases might follow incontrovertibly from a minimal axiomatic core. Through Kant the laws gain a new interiority. Minor critical diagrams; or a sketch of priorizing forces. The cosmic quest of reason. Critique and experimental crucible, the crisis of thinking… —Critique isolates truth-programs by performing deductions of problematic points in the plane: normalizing the exterior points at infinity of God and genesis (and neutralizing the interior infinitives of the soul and freedom…) The intractable points are also transcendental clues of an outside (the birth of the cosmos, the involution of the soul, the strange alienation of human freedom… and Judgment.) The critique demands we cease the attempt to directly establish a connection (through reason alone…) to transcendence or immanence; Kant’s answer to the skeptics is entirely symmetrical to that of the dogmatics… —Kant famously leaves room for faith. The space of reason cannot attempt to incorporate directly a living-space for the divine; the paradoxical architectures of the direct-connections-to-transcendence result in a tower of Babel, which skepticism could not fell (but which would rather have to wait until the Skywreck of critical philosophy.) —To each his own rational habitation on the plane, constructed with the sharpest tools one can find or create, utilizing a new ‘idiomatic’ architecture whose design the first critique inaugurates. Rational construction tests at every step; every notion is provisional, conditionalized. Following the transcendental demands we are capable of recognizing the illusions peculiar to the use of reason, avoiding in our ratiocination both the skeptical abyss and dogmatic heavens. Set aside all first-order claims (the tribunal demands.) What is relevant are your transcendental lines. —Reason may become a calm surface (in which ideas may unfold safely and take part in an ongoing synthesis.) Here is an aspect of the key problematic again: what guarantees this continuity of conceptual genesis; what contracts its momenta into a singularity, from which an infinite interiority follows — i.e. the conditional structures of experience-in-itself. But how should the plane be smoothed so that it may support these constructions? What ought to condition the internal structure of the schema? It is not enough to introduce a system of transformations; new machinery must be activated, plugged into an outside. The schema must relate to clear premises and permit an ‘internal’ flight towards ever-higher principles; as well as a descent towards dynamically unfolding consequences; there is a critical regulation or delimitation of (the possible structure of) transcendental schema themselves. Is this perhaps the two-phase engine of critical philosophy: imagination engenders schema; reason elaborates and regulates these structures? Extracting transcendental lines and rectifying the schema in turn. This is one of the key dynamisms of the critique: table-creation. Consider these operations that the tables try to capture: (iterative) categoreal unfolding, (as activated by) spacetime morphisms. (Almost a model of generation of synthetic experience? The psychonautics of the critical voyage…) Kant in his way offers countless warnings about the plane and the illusions it engenders. Grant yourself enough caution to safeguard the critical experimentation of reason on itself, from veering either into crippling doubt or pious obedience. The voyage of thought always risks the vortices of the problematic points, succumbing to the dialectical illusions that haunt the plane. The epic quest of reason, navigating carefully to avoid the involutions of the plane, where spacetime and the categories are in fusion or flight; these black holes of consciousness, culture, communication… It is these transcendental unifications themselves which are endlessly self-dividing, generating hallucinatory ‘double-articulated’ extensions of exteriority into the middle, operating both through a transcendent figure establishing external relations and contracting unified points (representation); and as immanent forces conditioning and mutating these points, discovering higher-order conjunctions (expression). Flying machines. The critical is at once cosmological and civilizational. —Cosmic because expressing an ambition of thought, yearning towards voyage and desire for external relations… The universal spontaneity of speculation, metaphysics, philosophy. Thought has (something like an innate?) desire for the air of the outdoors; beckoning sea-air, rarefied mountain-air. —Civic because the critical is a cybernetic self-modeling of thinking by which thinking may iteratively improve and refine itself. These iterations are composed of experimental operations extracting transcendental lines, in order to orient cognitive-navigational determinations. (What is critical democracy? But we already know; the shape of democracy-to-come was to be in the Kantian image: the critical experiment in self-governing grounded in rational civic self-knowledge; this dreaming that for so many and for so long would be a nightmare, e.g., for women, minorities, etc.) Perhaps we can therefore imagine also a molecular cruciality: a nano-critique, intensively mapping the logico-aesthetic diagrams engendered or supported by a material flow; a counter-transcendental line, with experiments yielding flows of transcendental particles, or (equivalently) emitting waves, a tiny flux of thoughts. The differential continuity of synthesis. Thinking is a sea of pure cognitive amplitudes, belonging to no one. —It is maybe worth mentioning in this context the relationship between Kant and Leibniz, and to suggest why it is so important for Kant to answer Leibniz — perhaps Kant here senses the minoritarian or infinitesimal transformations upending from within all the figures of the tribunal, and finally the tribunal itself (replacing it with a kind of computer…?) –The form of the antinomy posits a simultaneity of successive accounts, expressing a minimal critical operation of dyad-contraction and singularity-formation — apparently two operations which are unified, ordered-together, placed into simultaneity… Reciprocal causation within the faculties, within cultures. The mechanism of generic unification is opposed to the immanent as much as to the transcendent; rather constructing a transcendental line which convokes the transfiguration of transcendence and immanence, positing them as derived features of a higher politics of thought, aspects of a thought-image which accompanies a civilization. Proof by isometry. How might reason be designed otherwise? (Are there other lines along which an alien or future reason might unfold?) —Reason is provisional and engaged in a continuous refactoring of itself, in modification of premises and structures. With each experiment, the identity of the reasoner is transformed, they become otherwise, they learn something new; they advance along transcendental lines: either they reconstruct the habitation on the plane, or they rectify the topology of the plane itself (smoothing or striating, imposing flat uniformity or extruding mobile diagrams…) Reason as auto-alienating machinery: a self-moving engine operating reflexively upon its own conditions. There is absolutely no guarantee of safe passage here. The end of Kant’s voyage is a disappointment compared with the fanfare of its outset; its promise of squaring the philosophical circle once and for all, of finding a sure path to the End, isolating the ordered lines conjoining minds and bodies… Instead the system becomes dynamic. It is open onto a circuit of experimentation. Disciplines are plugged into one another to form grand architectures of reason, in which the central tribunal operates as router, switchboard, isomorpher; guarantor of smoothing/flattening. Transcendental equalization, metaphysical neutralization. The light in which the light is seen. Kant devises new strategies for reaching the universal, the necessary. But why are these strategies themselves necessary? This is Nietzsche’s question to Kant — granted synthetic a priori knowledge to be possible; why is it needful? —An obscure disaster conditions or engenders the critical philosophy; this philosophy which moves, pieces-together a case, in the wake of skywreck… It is as though when all the blows of the dogmatists and skeptics have played out, and we have reached the final end of history, that the critical philosophy finally rewinds: passing backwards through the entire line in an instant, forestalling the endless conflict. (Synthesis unfolds the most general dialogic of an externalized relation: this moment and the last; succession and iterability; being and becoming, etc.) Critique contracts dyads into singularities and performs a deduction of the idea underlying the fold which conditions the dialectical illusion (perhaps it takes a motivated reason to follow the syllogisms in this direction, towards presumptions about the real.) This (critical fold) founds a new philo-cognitive architecture in the wake of the destruction of the tower of pre-critical reason (which skepticism had never ‘really’ accomplished, since it was unable to reach the transcendental ‘beyond’ transcendence; it was not careful enough in the encounter with its own immanence…) —The condemnation of the tower stems from the annihilation of direct connection to either transcendence or immanence. Now instead we conjoin or disjoin through a higher-dimensional manifold, an enriched substrate capable of supporting the conditional operation of transcendental lines. Thus, after the collapse, the enchanted dawn; a world illuminated by the critical light of a transcendental sun. There is an absolutely unconditioned upstream of every syllogism, through which every proposition may be genealogized; all syllogisms link together. This apeiron is thus a lodestar for the critical navigator, who is otherwise adrift on the open sea of algorithms. 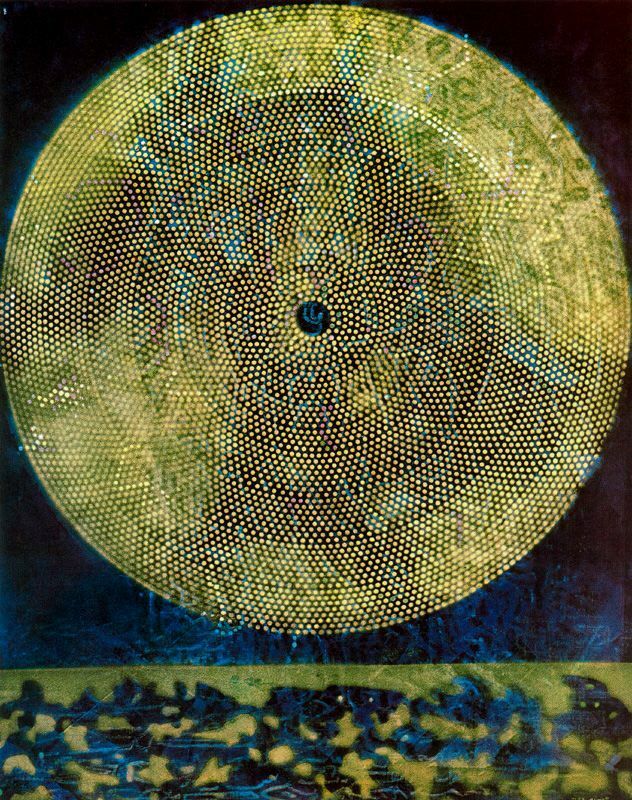 The transcendental sun of the unconditioned: a hypothesis, an instrument for measuring the wavelength of the potentiating light which emanates from the indeterminate within the formal machine of reason. Despite the foreclosure of direct access to the problematic points, this long labor of establishing the parameters of the universal Plane of reason activates potentials for critical (re)construction, according to self-given plans, at once regulating practice and subjecting even its own procedures to examination and experimentation. Isocline. The affect of the transcendental, the Kant effect; the material curvature of time, a specific topological inflection imparted by the vertiginous transcendental line. In the preface to his book on Kant, Deleuze remarks on the ‘giddiness’ of the subject divided by the unity of apperception: a thread of time which continually divides the individual from themselves, present from past; which is finally overlaid by a moral thread; the cosmos transfigured by guilt. —Pure reason guides itself along a transcendental thread which orients thought and makes it ‘accessible’ at every point. In order to synthesize, critical reason must have erected axiom-systems, tables of transcendental forces, fourfold schematics to flatten the universal and necessary onto metaphysics. Were these tables ‘caught’ in the middle of a process of becoming-diagrams? The transcendental or this movement-without-movement which consumes entire worlds whole. In critical philosophy there is an internalization of the law; the tribunal expresses reason in glory, but also in judgment. The sense of a transcendental condition is that which is universal and necessary prior to any possible object: formalization as de-specification. Kant endorses a realism about the universe, despite his foreclosure of metaphysical knowledge of ultimate reality. —He envies on behalf of philosophy the clearly universal and necessary access to truth unfolded by geometric construction and physical law. The successive tables of categories, notions and ideals are structured like a stacked system of hierarchical physical forces, each layer depending on valid combinations of elements from the one beneath. The structure of knowledge is systematic and ideally syllogistic; this image of reason is opposed to that of subjective-association — this condition of the transcendental is close to the heart of the realist core of the crituque, which wishes philosophy would restrain itself from first-order claims in order to enjoy (on the transcendental plane of pure reason) a similar certainty and sure-footedness as geometry and physics enjoy. Metaphysics at higher dimensions. The first critique presents itself as a mission of peace — on the one hand, to give philosophy clarity on its limitations regarding claims to first-order knowledge of reality; on the other, to give science space from the imposing imaginations of the philosophers, permitting it to reason out empirical laws for itself through experiment. Pure reason is presented as the means of achieving confidence in facing dogmatists and skeptics — here the problem is not simply that their first-order pronouncements could never touch the noumena anyway, but rather that the debates about specific first-order metaphysical questions, the swirling dissensus around the singularities, follows from the transcendental structure of experience; and pure reason, critical reason, can isolate these structuring lines, permitting careful synthesis and traversal. At any rate: we are equipped not to fear the arguments of metaphysicians presuming to know reality, or those presuming it is entirely ineffable. We can seek truth on our own terms, directly with our own reason, conducting our own experiments. We need only the critical regulation of transcendental lines, which smooth over the problematic singularities puncturing the plane. Perhaps philosophy is encouraged to a practice of universe construction; knowing more clearly, and using with more subtlety, the affects which their hypotheses and axioms engender, the way our concepts plug into a transindividual matrix. A calmer, more sober reason, despite the wild freedom of the open horizon. The commitment to the adventure of critical thinking demands a detachment, perhaps especially to navigate around dialectical vortexes, to deal confidently with the fantasies that haunt the plane; to ensure smooth synthesis around asperities and difficult points. There are necessary distortions of the plane that any rational thinker will experience as they attempt to navigate (with) their own reason. And reason will always, necessarily, be open to error, so long as it possesses imagination — this free power of composition of the notions it possesses. The long error, for Kant, is perhaps mistaking subjective association (connection) for an objective determination of conjunction (implication of causality.) The transcendental ego invests the problematic points around whose limits form inevitable dualities, engendering a field of differential postures (for the dialectic to sophisticate…) Enfolding the ‘ends’ of the universe or the soul, the transcendental cuts a line to the edge of the real; every turn away from the contour of this thread falls into darkness and illusion. There are necessary illusions of the plane of reason, indicating conditional limits of metaphysics. Critical reason constructs a tribunal capable of neutral arbitration of the rival claims of the contending dogmatics and skeptics. —One may recognize the critical philosophy by the establishment of a courthouse of reason — tribunals which not only legislate ideas and differentiate theories by experiment, but principally regulate practical matters, weaving plots together to collectively create programs, law-tables, world-systems; all the ordered sets of structured explanations which are necessary for rational freedom. Selection by division. A synthesis communicates an abyss of time, contracting an infinite multiplicity and externalizing it into a problematic point on the plane of reason: as a singularization (finally subjectivation). The first critique recognizes the loneliness of the ‘void inane’ beyond spacetime, or at its limits (or at the boundary of black holes.) Perhaps Kant knows something about the sad workshops in the depths of the cyclonic signifying points (god/soul/genesis/freedom). Does criticism detect the weariness of the dialectical trade (the interminable war between philosophies)? Critical reason constructs legal edifices for the evaluation of philosophical claims, in order to place Philosophy on trial in turn. Critical philosophy discovers or creates a pure mode of intellection by which religion and philosophy at once may be challenged. Neither affirmation nor denial may pass the tribunal; every notion is made to become analytical. The critical passage seems smoothed in advance, but it also incorporates a superabundance of caution, even as it begins to catalogue the interference mechanisms by which the problematic points will diffract the plane of thinking. Kant models dialectical problems as combinations, categoreal-spatiotemporal conjunctions or disjunctions. —This modeling demands the suspension of first-order metaphysical axioms; and perhaps here Kant even provides a sketch of incompleteness and inconsistency “proofs” for metaphysics, noting the mounting incoherence of the philosophers as they approach the singularities; the way the problematic points unfolded philosophy in turn, diffracting it. Kant wants to build houses for reason along transcendental lines — neither arcing towards transcendent heights nor drawing towards immanent depths; but rather building directly upon the smoothed surface of the plane of reason. The new image of reason will be the Tribunal — a speculative court or philosophical council. The trial is a game of laws and rules, where only higher-order claims, transcendental conditions of the case, may be admitted into evidence. The tribunal is a filter, a crucible of selection. The jurist must find or make a transcendental mixture, discover the hypothetical line which passes beyond both (dogmatic yea or skeptic nay). What is the syllogism? A mechanism of binding language to a world, a strategy of co-determination. —The critical philosophy is a loop of tangled circuitry (logical and spatiotemporal). Kant constructs a black hole computer using Newtonian physics (Longo has an interesting paper exploring the possibility of building a Turing Machine from clocks…) The transcendental line condenses an infinite series into an image, a unitary figure. The real lightning-quick movement of the critique: the folding-up of the series, contraction into event, a contraction which is also transcendental unity; in its way already consciousness and culture, a minimal auto-sophisticating structure capable of enfolding timelines. The dialectical problems are caught up with a-causality, a point outside of time; and Kant demonstrates the apparent ambiguity of these points — for what could be outside the series, yet exercise power it, over ‘all’ of it? Who wants the truth of the case? There are all the figures of a courthouse drama in Kant. But perhaps most interesting is that of the philosopher-as-investigator of metaphysical crimes, the transcendental detective who supplies advocates with their stories and evidences. —The detective works with officers of the court, but is really unlike them, since he is looking for something else entirely, or from a different direction. Everyone knows the bare facts of the case; the question is what story we should tell about them. The detective is after the conditions generating the structure of these stories: the transcendental sense of the case. He is looking for something that escapes the law; wanting to discover whether it broke through it or broke down; not what story correlates with these facts but what hidden system of writing structures these stories. (For instance, the novelistic question “What happened?” stages a dramatic retelling or explication; it also smooths space or flattens time, in order to contract the sense into a pure figure.) There’s all the mystery of a detective novel in the first critique. At first the case presented as the seemingly straightforward problem: where does synthetic knowledge a priori comes from? Who or what has committed this transcendental crime of connecting thought with the outside? But of course the case quickly becomes one of regulating thinking, even demonstrating in a way that the crime never could have taken place — it was only thought to have taken place due to certain errors in reasoning, dialectical illusions. A crime that disappears when you don’t philosophize it. The case quickly takes a turn: it becomes a problem of safely inhabiting the rectified plane, of constructing a rational habitation according to new self-given principles. Becoming worthy of this critical freedom, of the freedom in thinking: this dare accompanies injunctions, warnings about respecting our own limits (the limits of any rational creature…) We meditate on limits, in a way that transforms us. (Watching for the warning buoys around dangerous points in the sea.) The tribunal as a lawful filter, a process of selection. The thought that can pass the trial of reason is one that dispenses with direct assertion or denial, and instead favors this indirect elaboration of the conditions of the case. In a way it’s interesting how little Kant dramatizes his problems; his detachment appears so total (as though he knows the constitution of the transcendental line depends in some way on his sobriety.) But suffice to say the work as a whole is not a syllogism. Rather it is building a machine that conceptualizes the syllogism as apotheosis of reason. Spacetime and the categories are formatted for the dialectical role they will play; being set into a system where they activate each other reciprocally… —Consider the ancient method of division: analytically decomposing the case into various possible classes, then subdividing these, until you’ve constructed an identity by hierarchy. Philosophy as decision-tree; there’s a lot of dangers in this formal-material game. Yet perhaps it is in doing this analytic operation that one creates or discovers problems that move between the species and the genera; problems which involve pure morphological-organizational powers, operating along transcendental lines. The critical sense detaches: it steps away from direct affirmation or denial. Neither bare affirmation nor denial are legal operations of critical reason. The tribunal is not just concerned with condemning the tower, but promulgating new building codes. The possibilities of construction have to change, and even what that construction aims for as well. Both the earth and the skies are under our governance: we have to take responsibility from the depths to the heights of reason; since reason also engenders these concepts that transform and distort the plane. There’s a practice of world-creation in the critique, even if the method appears subtractive. Are we working case by case, seeking to find (discover) and never jumping to simply label phenomena this or that? Are we seeking lines that traverse all of spacetime at once? Fusion and the unconditioned. There is a becoming-crucial at the heart of the critique, the movement of freedom of thought, which opens onto a generalized practice of self-guided experimentation. With respect to reason this process forms a circuit: auto-construction of identity, which attaches relentlessly to every thought. Every effort at alienation merely distends this loop. A crisis, a crucial moment must occur; the appearance of a fascinating sign which occasions thinking, an awakening or daybreak. How to escape the circle of the sea? (How to ascend via syllogism towards the transcendental sun?) Any division of power into genera is also an exponentiation; every isolation of a property ends up collecting and accumulating what analysis divided. —The indeterminate escapes into the empirical. The critique is a matrix of self-experimentation, a generalized program of auto-sophistication; the transcendental science of mind. The plane of concepts has been made to operate as a sort of variable membrane, a filter through which a luminous singularity is made to directionally pass: downstream towards the consequences, upstream towards less and less conditioned principles, whose limit can only be the unconditioned. Kant wanted a legalistic principle of critical distinction, capable of deciding between metaphysical accounts, based on principles whose universality and necessity would be inarguable. In Kant’s convocation of the tribunal, there is indeed a transcendental linearization of the case of thinking, the extraction of axioms and formation of an operating system of relations: the construction of a program of reason itself. —What really are these alienating powers of entailment and hypothesis? But maybe the more urgent problem is how to safely operate them, given all the dangers inherent in a line of experimentation. The glory of the transcendental sun which exceeds our categories and invests spacetime with a new significance… Kant’s room for faith is also making room for philosophy — for the critical philosophy in particular, articulating its space within the metaphysical order: an enchanted philosophy of transcendental lines… The transcendental line is like a glorious solar body which entices us to become a thought-particle, to traverse the field with infinite rapidity, to embark upon a journey without duration. Let us space, let’s voyage-in-place. (Deconstruct and deterritorialize the image of thinking…) But keep wary: especially when you may be in enemy territory. Remember all the warnings; know your limits. There are dangers at sea, even in these verdant isles.